Anne Hillerman, daughter of the late Tony Hillerman, told the Albuquerque Journal that she will continue her father's "Joe Leaphorn and Jim Chee" mystery series. Spider Woman's Daughter, will be published in Fall 2013 by HarperCollins. Anne Hillerman is the author of several non-fiction books, and this will be her first novel. Anne has acknowledged never asking her father for permission to continue the series, but is convinced he would approve. He always took her suggestions seriously. "He was such an icon," she said. "There are people who know his work better than I do. Whatever I do, some people will say, 'This is not Tony Hillerman,' and it's not. [But] it has to be good enough to stand on its own." 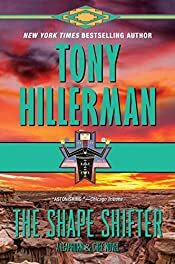 The plot of Spider Woman's Daughter picks up at the end of the 18th and final book in the series by Tony Hillerman, The Shape Shifter; more about that book below. Officer Bernie Manuelito, now married to Jim Chee, witnesses the shooting of a police officer at the Navajo Inn in Window Rock, Arizona. During her investigation, she discovers a fresh body at Chaco Canyon. Anne's publisher has contracted her to write two books. "I really have mixed feelings about it," she admitted. "It was something I had to do. I couldn't let this series end without giving Bernadette the chance to be a hero. You have to take a deep breath and hope for the best." Retirement has never sat well with former Navajo Tribal Police Lieutenant Joe Leaphorn. Now the ghosts of a still-unsolved case are returning to haunt him, reawakened by a photograph in a magazine spread of a one-of-a-kind Navajo rug, a priceless work of woven art that was supposedly destroyed in a suspicious fire many years earlier. The rug, commemorating one of the darkest and most terrible chapters in American history, was always said to be cursed, and now the friend who brought it to Leaphorn's attention has mysteriously gone missing. With newly wedded officers Jim Chee and Bernie Manuelito just back from their honeymoon, the legendary ex-lawman is on his own to pick up the threads of a crime he'd once thought impossible to untangle. And they're leading him back into a world of lethal greed, shifting truths, and changing faces, where a cold-blooded killer still resides. Thanks for mentioning my new book. I'm excited, and hope that my Dad's fans will enjoy the opportunity to see Dad's characters in action again. I'm very excited about this news and can't wait until the book is published.